Marvel Anime: X-Men debuts tonight on G4 at 11 p.m. Eastern. The good news about Marvel Anime’s new X-Men series is that it’s leaps and bounds better than their other anime shows, like Wolverine and Iron Man. The bad news is it wouldn’t take much to be leaps and bounds better than either of those shows. The cold opening for “The Return” shows that the story for X-Men is appreciably more advanced than either the Iron Man or Wolverine anime. It starts with the death of a major character and then forces the characters to live with the consequences of that death. This, for a Marvel Anime show, is a fairly sophisticated development. The production values of X-Men are also significantly better than either one of Marvel Anime’s previous titles. Madhouse Studios, the Japanese production company responsible for all of Satoshi Kon’s films and now all of Marvel Anime’s titles, has saliently stepped up their game here. This is a welcome improvement because, while one would hope that a team-based show would have better production values than shows that focus on individual heroes, there was never any guarantee that Madhouse would necessarily fulfill that greater need. The animators for Wolverine and Iron Man sleepwalked through the first episodes of both shows, each one full of stiff characters and unmemorable backgrounds. After the cold opening for “The Return” however, I wasn’t afraid that X-Men would look cheap and/or unimpressive—though I wouldn’t go so far as to say that the show’s animation was more striking than that. X-Men’s pilot is, at best, just mediocre enough to not be terrible. And yet, for all that guarded praise, X-Men is only mindlessly enjoyable in a “I wouldn’t-mind leaving this show on while I eat dinner” kind of way. It has a lot of the basic storytelling problems as the other Marvel Anime shows. Episode director Fuminori Kizaki employs many of the storytelling techniques that sometimes make anime look hyperbolic, cacophonous, and just plain silly, all the bad narrative short-cuts that any director—whether they’re directing cartoon characters or live actors—should eschew. For instance, Kizaki relies heavily on clichéd action poses throughout “The Return.” Cheesy action lines underscore the intensity of protagonists’ movements while Kizaki’s “camera” pulses and shakes around the X-Men whenever they’re yelling (Dramatically!). Both of these cop-out approaches make it possible for Kizaki to avoid thinking about how to choreograph a fight or even just competently block a basic action scene. And that’s to say nothing of the slow and mostly basic plot that Kizaki’s bland style sets up in “The Return.” The episode’s story, which was written by Warren “I’ll take a check” Ellis, is a couple of distended table-setting scenes that have been drawn out into an episode-long plot. In the show’s first scene, Jean Grey, the powerful psychic that Scott Summers (a.k.a. Cyclops) and Logan (a.k.a. Wolverine) both love, has transformed into the Phoenix, “an Omega-level mutant.” This means that she’s so powerful and volatile that, “If she goes supernova, we’re all dead.” Soon after that, Jean sacrifices herself in order to prevent such a supernova from happening. This gives Scott an excuse to disband the X-Men and Byronically brood on his own time. Until the events of “The Return,” that is. 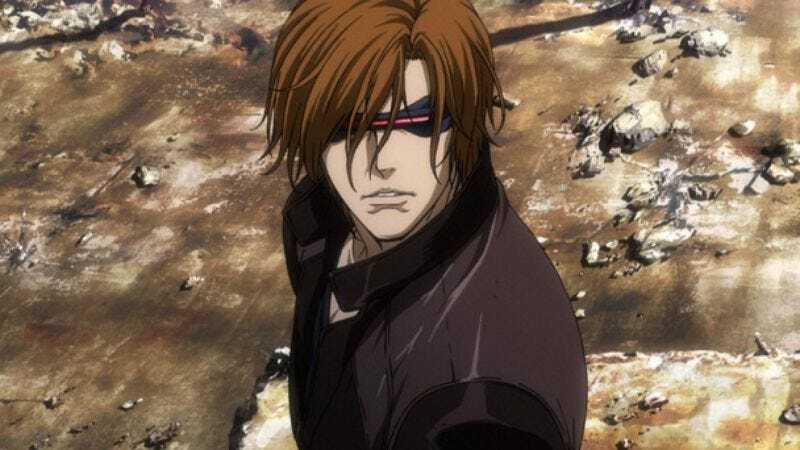 For reasons that don’t really matter, Mastermind, the leader of a group of evil mutants called the Inner Circle, has kidnapped a mutant teen named Hisako Ichiki. Mastermind previously infiltrated Jean’s mind and is probably responsible for transforming her into Phoenix. In the year that passes between the past represented by the show’s cold opening and the present that begins after the show’s opening credits, Cyclops mourns Jean’s death. He spends most of “The Return” biting his lip and unconvincingly looking conflicted and pensive at the thought of leading the X-Men again. Hirota’s dialogue isn’t awful because he cut corners but rather because he cut corners in a very uninspired way. None of the zingers he gives Logan or Scott are even immediately worth a chuckle, like when Logan jokes, upon seeing Scott in his X-Men uniform, “Well, well, if it isn’t the guy that put shoulder pads and tights back in fashion.” Scott rejoinders, “Yeah, well, I couldn’t miss another minute of your witty repartee.” Anyone could have written that line, and while I don’t need my X-Men show to be ghost-written by Tom Stoppard, I do want it to engage me in some way beyond purty imagery. Unfortunately, the amount of money that Madhouse put into X-Men’s pilot is the only thing that makes “The Return” worth watching. Which is sad when you consider how unimaginative Kizaki and Hirota are. If Madhouse had hired a creative team that wasn’t asleep at the wheel to write and direct the show, X-Men might have been something worth praising. “The Return” isn’t even that good.